TOTALLY ADVANCED. UNIQUELY FUNCTIONAL. EASILY AFFORDABLE. 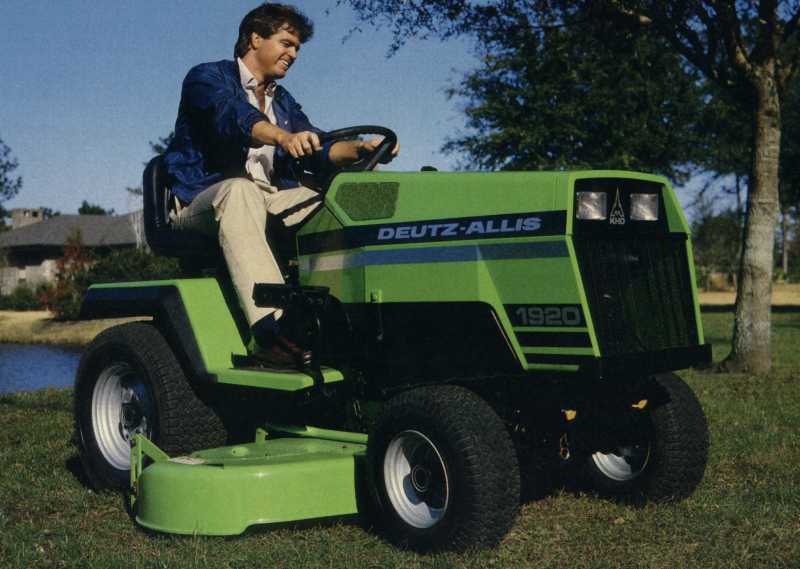 Meet the Deutz-Allis 1900 Series "Ultima" Garden Tractors -- new from the ground up! Two hp sizes-Model 1918 with 18 hp, and Model 1920 with 20 hp. They're computer-designed to set unprecedented performance and reliability standards today and into the 21st century. Take a close look. Discover compact farm tractor performance at a garden tractor price. For home owners, landscapers, yard maintenance companies, industrial parks, municipalities, small farms-wherever there's more than just a little yardwork to do. 1. Kohler Magnum engines. The most advanced in the industry! Size for size, these engines deliver more power, more torque at lower RPM. Quiet running, low vibration, low oil consumption, and quick starting electronic ignition. 2. Cool, quiet operation. Ducted airflow design draws cool, clean air through screens at the top rear of hood. 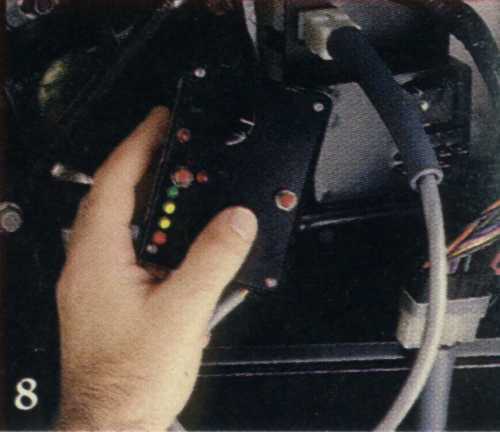 Air is channeled through the engine by a computer-designed fan that delivers high volume with an extremely low noise level, providing exceptional engine cooling. Allows it to operate up to 15% cooler than competitive units for longer engine life. A combination of lo-tone muffler, rubber engine mounting, specially designed fan, and full engine enclosure means very low noise levels, for greater operating pleasure. 3. High-strength main frame. 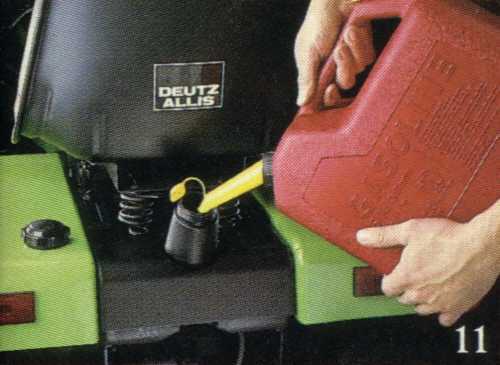 Critical stress points defined by computer, strengthened by Deutz-Allis. Heavy-gauge formed steel frame runs the length of the tractor. Superior protection for the power train, less noise and vibration for the operator. 4. Reliable hydrostatic transmission. A perfect complement to Kohler Magnum power! With direct shaft drive from engine. The Sundstrand 15 Series hydrostatic transmission has proven its reliability on larger tractors. 5. Massive transaxle. 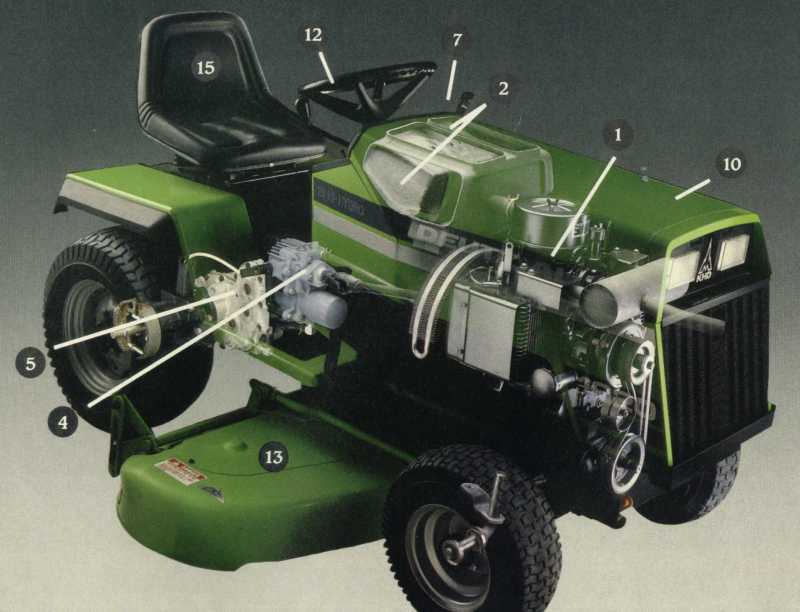 There is no better transaxle available in a garden tractor. Features automotive-type steel bevel gears and large diameter axles. 6. Super "Dual-Poise" stability. 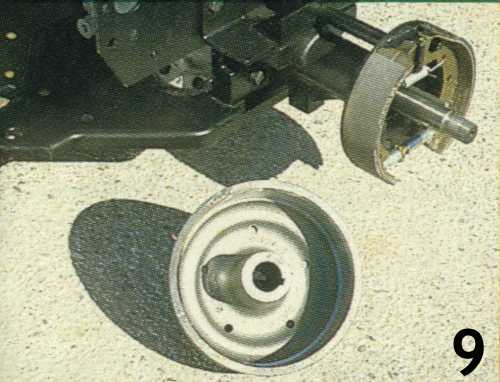 Massive cast-iron steering axle improves lateral stabilia, through a unique double-pivoting system. 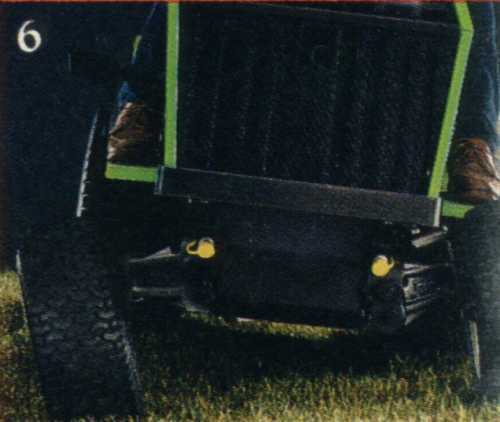 This "Dual-Poise" front axle with rugged 1" diameter spindles provides a degree of ground-hugging performance conventional designs can't match plus tight 26' turning radius. 7. 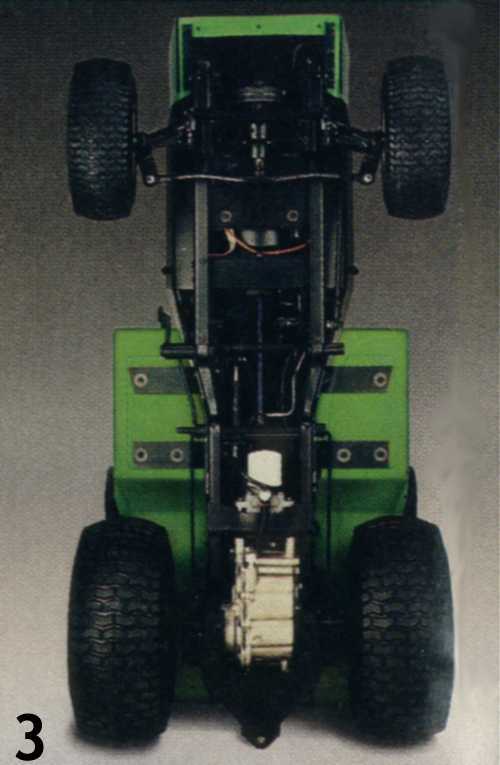 Single-lever hydraulic lift. Raise or low ~ front, mid or rear attachments with fingertip ease, without special hydraulic extras. Dual hydraulic control with front outlets is optional. 8. Electrical diagnostic center. Exclusive feature permits instant check of electrical functions from a convenient location under the hood, on right side of tractor. 9. Heavy-duty adjustable self-energizing brakes. Large automotive drum type, with more braking capacity than band brakes. 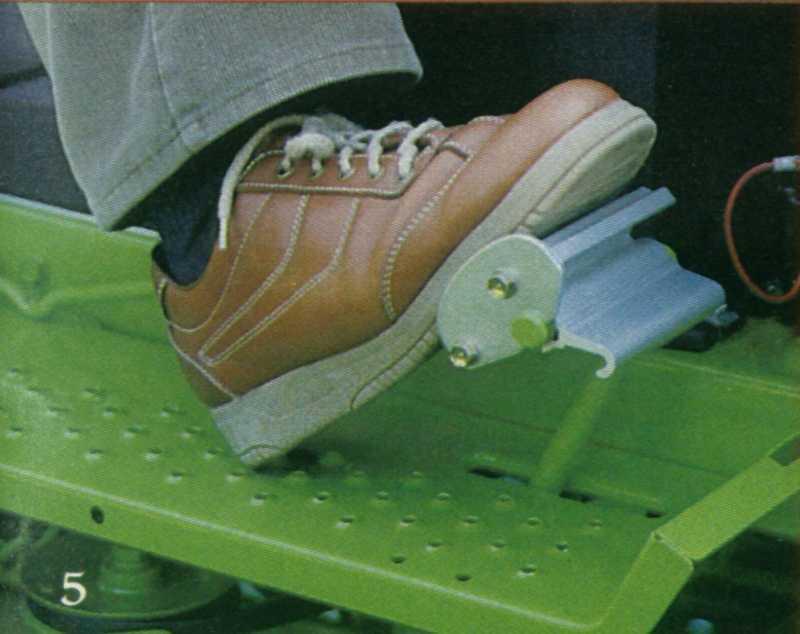 When depressed, brake pedal(s) automatically move hydrostatic drive control toward neutral. 9A. Dual brake pedals on the 1920 can be locked together, or used separately for sharp turns. Provides smooth, effortless braking control. 10. Unique hood design. Heavy reinforced steel construction with durable baked-enamel finish. Tilts forward for full, easy access to the engine and servicing components. Ensures long, trouble-free protection to engine compartment. 11. Large 4.25-gallon fuel tank. Provides extended operating periods. Easy to fill from rear of tractor. 12. Low-effort steering. Hydrostatic power steering standard on the 1920, optional on the 1918. Smooth, double-gear reduced mechanical steering also available on the 1918. Large, sure-grip 15" diameter steering wheel. All operators will appreciate the effortless ease of steering to handle any job on any terrain. 13. Shaft-driven implements. Shaft drive for simple, sure power transfer to all front- and center-mounted implements. 14. Full instrumentation and control. Includes standard fuel gauge, hourmeter, voltmeter and monitor lights for low oil pressure, transmission-neutral, operator-present and PTO engaged conditions. Hydrostatic drive, hydraulic lift, throttle, choke, PT0 switch and parking brake lock are all within easy reach. Operators are in full command of all tractor functions. 15. New safety seat. High-back comfort seat automatically shuts off PTO, or stops engine (if transmission is engaged) when operator gets up from seat. PT0 cannot be re-engaged until operator returns to sitting position. Molded thick-cushioned seat slides 4-1/2" fore and aft, has adjustable spring suspension. 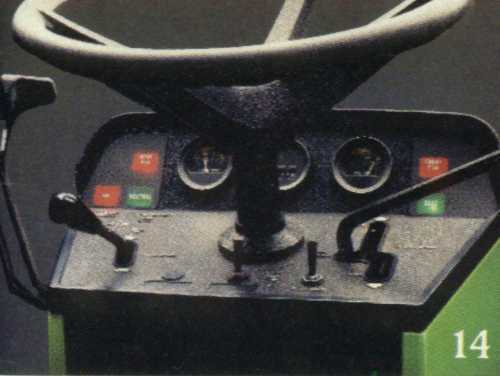 Human-engineered operator's station makes running this tractor comfortable and fun for the daintiest female or the brawniest man. 2-Year Limited Warranty. Like all Deutz-Allis lawn and garden riding products, the new 1918 and 1920 "Ultima" Garden Tractors are protected by our 2-Year Peace-of-Mind Warranty, which includes the new Kohler Magnum engine.